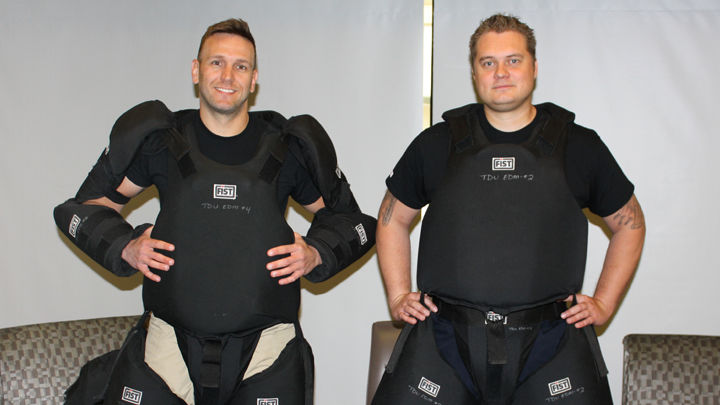 Heavy protective padding is worn during training so peace officer recruits can train more realistically, should force become unavoidable. Here Justin Atkinson, left, and Brandon Danvers strike a padded pose. AHS Protective Services achieved a quality milestone recently when its in-house community peace officer training program became the first of its kind in Alberta to be granted accreditation by the Alberta Justice and Solicitor General Peace Officer Program. This is recognition that Alberta Health Services (AHS) — the province’s largest employer of community peace officers with 430 on staff and 330 on contract — brings the gold standard in training to its security team. The program’s in-depth curriculum covers topics such as legal studies and statute enforcement, tactical communication, de-escalation techniques and the use of restraints as a last resort — all taught in a way that keeps our 110,000-strong workforce plus patients and their families safe — at an estimated 1,400 AHS sites across the province, including 106 acute-care hospitals and five standalone psychiatric facilities. Keeping the peace at AHS is a challenging and rewarding experience. In a typical 24-hour period, the Protective Services Communication Centre (PSCC) — the provincial dispatch centre — receives 1,000 incoming calls and administers 3,300 radio transmissions. Over the past year, Protective Services responded to more than 64,200 incidents, with violence reported in 4,533 of them. Superior, accredited training gives officers strategies and skills to avoid or minimize violence, adds Scott, who joined AHS in January this year after a distinguished career with the RCMP, where he achieved the rank of Chief Superintendent. At the time of his retirement, he held the position as the acting Criminal Operations Officer for “K” Division (Alberta), with responsibility for more than 3,200 RCMP officers. Accreditation doesn’t happen overnight, says Simon Boutros, Provincial Manager, Protective Services – Training & Development Unit, who spearheaded much of the effort. Making the grade required eight years of content development, with the final few years spent in intense collaboration with curriculum designers at Alberta Justice and stakeholders in the Solicitor General’s office, which formally granted accreditation in March. Another key aspect to successful training is selecting candidates who have the right stuff for the job — an evaluation that relies in part on mental, physical and psychological assessment. “We seek out people who want to impact people for the better,” says Boutros. “People who have an understanding, and who have a wider perspective on the world, who understand the complexities people are going through — and who try to help people through their problems. The Executive Leadership Team has witnessed firsthand the AHS’ Community Peace Officer Level 2 Recruit Training Program in action. Members of AHS Protective Services gave an incredibly realistic demonstration of three of their reality based scenarios: restraining and arresting a subject armed with a knife; de-escalating a tense situation and escorting a verbally aggressive subject out of a waiting room; and controlling a physically aggressive subject and placing them in handcuffs. Scott and Boutros shared their thoughts on some of the skills and tactics they teach with regards to these challenging situations. Regarding the final scenario, adds Scott, “once you’ve made the decision that you’ve have grounds for arrest, and you’re going to place somebody in handcuffs — you want to do that with the least amount of resistance. You try to get compliance from that individual and put them in a position so that if they do decide to resist — because most people, once they feel that handcuff go on, they don’t like it. You will be able to control that resistance using the least amount of force. Heavy padding is worn during training, so trainees don’t have to hold anything back in a physical encounter with role players.